Robin Thorp, a retired entomologist from the University of California-Davis, spends much of his time in the mountains of southern Oregon looking for a bee. Specifically, Thorp is on the hunt for Franklin’s bumblebee, a species scientists fear may be extinct after having not been seen in ten years. Thorp, however, isn’t convinced and barely entertains the idea. Thorp, 82, continues his hunt with a bee net in one hand and a bee vacuum in the other. He walks from flower to flower, inspecting pollinators, vacuuming up what might be a Franklin’s bumblebee to closely inspect it. He does this for his own fulfillment, on his own time, and without pay. Thorp became aware of Franklin’s bumblebee in the 1960s. He was taking an entomology course when he gained an interest in insects. It wasn’t until around 1998 that Thorp began to study Franklin’s bumblebee. Back then, he recalls seeing the bees on every patch of flowers. “I’d see 15, 20 of them in just a short distance.” Only a couple years later did the bee become harder to find. “It was just gone.” Thorp hopes to discover the reason behind the bee’s disappearance. The U.S. 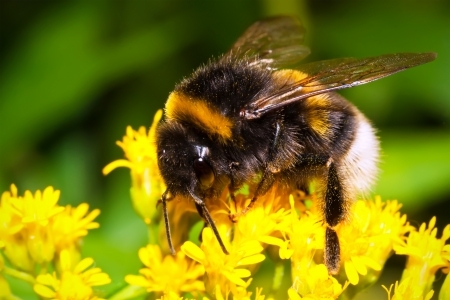 Fish and Wildlife service has Franklin’s bumblebee listed as critically endangered. Researchers haven’t seen the species since 2006, the last documented sighting of one worker bee. There are a number of possible reasons behind the crash of these particular pollinators. Habitat loss, climate change, and the rampant use of chemicals could all be factors. When asked about the value in his project, Thorp points out that you can’t put an economic value on a species. “To me, they’re all valuable. They’re all priceless really…Franklin’s is one that I’ve had a lot of personal investment in in many ways. And, yeah, I feel an attachment and kinship to it.” Thorp admits that as long as he can walk, he’ll continue his search for Franklin’s bumblebee.